DENTON, Texas – With five seconds left in the game, junior guard C.J. Burks went coast-to-coast to score the game-winning basket to help seal a 74-72 victory for the Marshall Thundering Herd men’s basketball team over the North Texas Mean Green on Saturday evening at the Super Pit. With the win, the Thundering Herd rose to 19-8 overall (10-4 C-USA), while the Mean Green fell to 14-13 (7-7 C-USA). To go along with his game-winner, Burks had a game-high 26 points, while junior guard Jon Elmore added 16 points, a team-high eight rebounds and five assists. Freshman guard Jarrod West dished out a game-high six assists. North Texas’ Ryan Woolridge had a team-high 25 points, while Roosevelt Smart added 20 points of his own. Poor shooting plagued Marshall for the first period, as it made 12-of-26 (46.2 percent) of its field goals, 3-of-13 (23.1 percent) of its shot from behind the arc and 6-of-9 (66.7 percent) of its free throws. 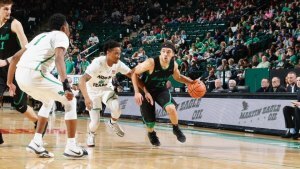 It was a whole other story for North Texas, as it shot 16-of-29 (55.2 percent) from FGs, 5-of-9 (55.6 percent) from three-point land and 1-of-2 (50 percent) of its chances at the charity stripe. After both sides began the contest evenly matched at 19-19 with 10:39 left, the Mean Green went on a 14-2 run over the next three minutes to take a 33-21 lead with 6:56 left to play. With 3:28 left in the half, Marshall’s fortunes began to turn. The Herd went on an 8-3 run thanks to Elmore, junior guard and a buzzer-beater by West closed out the half trailing 38-33. Elmore led the way with 12 points and four rebounds, while West dished our four assists. North Texas’ Woolridge led had a team-high 13 points after 20 minutes. In the second half, Marshall came running out of the gates, as it began the half on a 9-4 run to tie things up with 16:24 to go. The two teams would trade baskets until 6-0 run from Marshall gave the Herd a 59-53 lead with 9:13 to play. With 2:13 left on the clock, North Texas took a 72-68 lead after Smart made a step-back jumper. Burks nailed a jumper to cut the lead to two points at the 1:43 mark. After the Herd came up with a stop it tied the game with 35 seconds after Elmore found junior forward Ajdin Penava for the layup. The Mean Green had a chance win the game with five seconds left, but Woolridge’s jumper missed and junior guardRondale Watson made the rebound and called the timeout. After that Elmore found Burks, who scored the game-winner with 0.3 seconds left in the game. Marshall finished the game shooting 28-of-52 (53.8 percent) from the field, 7-of-21 (33.3 percent) from three-pointers and 11-of-18 (61.1 percent) from the free throw line. 21 of Burks’ 26 points came in the second half. The Herd held North Texas to 16.7 percent in the second half from three-point land after it shot 1-of-6.